"What good things this problem brings to me? Let me list of them all." Don't grow hopeless about any situation. In the 1950s, Normal Vincent Peale published The Power of Positive Thinking. The book’s message was that faith, prayer and positive thinking were the keys to a successful life. The book was wildly successful and had a record-setting run on best-seller lists. In part, optimists achieve more because they expect more, and as a result work harder and more persistently toward their goals. But it is also partly a self-fulfilling prophecy – optimists encounter fewer negative events in their lives because they take more proactive steps to avoid them. Optimism is a mental → attitude or world view that interprets situations and events as being best (optimized) and includes the hope that future conditions will unfold as optimal. 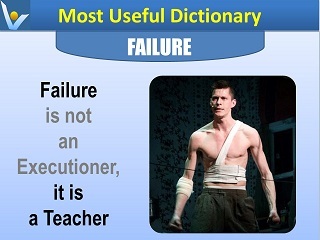 >> finding → success in seeming → failure. Whatever you focus on gets clearer. So, focus on good things. 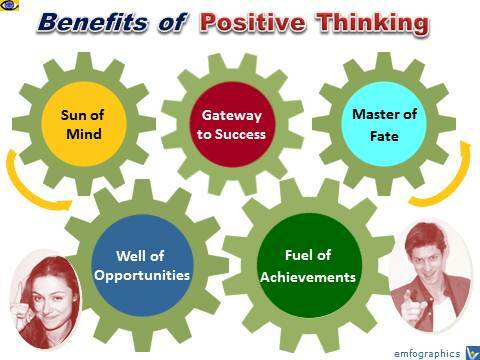 Positive thinking helps you turn problems and failures to great opportunities. Due to optimistic positive thinking, → problems will become merely challenging → opportunities that you can turn to your advantage. They provide opportunities for personal growth and can stimulate your → creativity for finding better ways to live. Can you become more optimistic? Can you adopt a positive attitude? Yes, you can. You are what you think! The simplest way to get rid of negative thinking is to empty your mind, clear it of all fears and anxieties while replacing them with positive thoughts. Cultivate a burning belief in your noble life mission and a burning desire to achieve → stretch goals. Develop a Can-Do attitude that will help you to → turn your dream to reality. Surround yourself with optimistic people because optimism is contagious. So is pessimism. Studies find that people who live with depressed people tend to become depressed themselves. Surrounding yourself with optimistic, supportive people will help you turn occasional optimistic thoughts into a habitual way of thinking. Believe in positivity. It is important to chose positive and honest people for your surrounding. 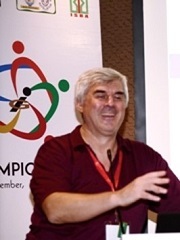 Another powerful tool for optimism is "2P & 3P thinking," suggested by Stephen Kraus. When good things happen to you, and when you accomplish your → goals, try to understand why those events occurred in Personal, Permanent and Pervasive terms. If you → manage a successful project at work, take credit for that success. Attributing it to your intelligence, for example, offers an explanation that is personal (you are intelligent), permanent (you’ll always be intelligent) and pervasive (your intelligence will help on other projects as well). 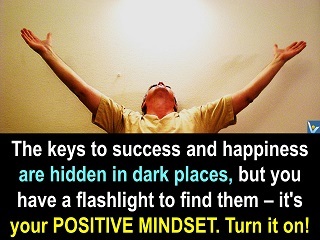 The keys to success and happiness are hidden in dark places, but you have a flashlight to find them − it's your positive mindset. Turn it on! I'm an optimist in the sense that I believe humans are noble and honorable, and some of them are really smart. Great groups are more optimistic than realistic. They believe they can do what no one else has done before. "I never saw a pessimistic general win a battle." "Optimism is the ability to focus on where we're going. Not where we're coming from." "Optimism is the faith that leads to → achievement. Nothing can be done without hope and confidence."